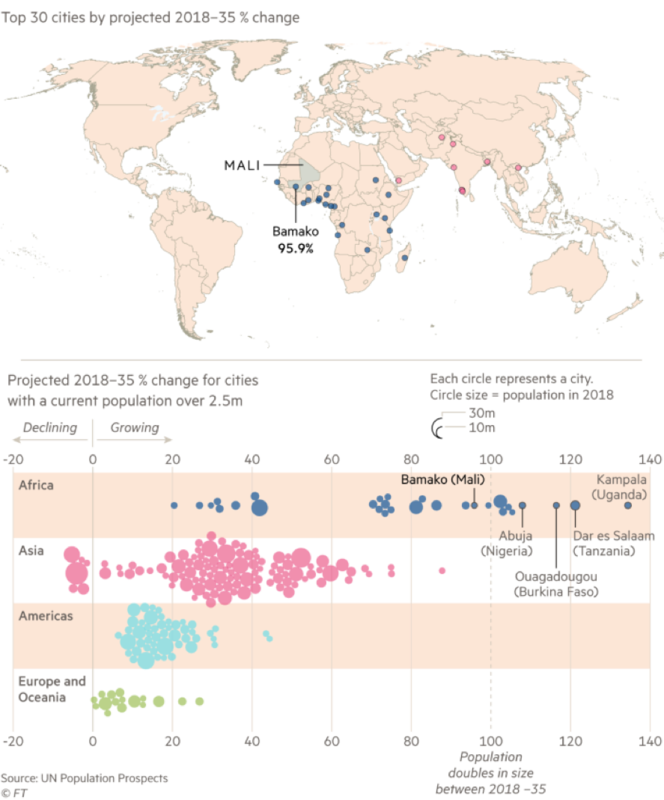 While Africa only has a handful of large, urban agglomerations when compared to places like Asia and the Americas, as the bottom half of Figure 1 shows, Africa will host eight cities that are expected to more than double in population size in the next 17 years. In fact, most of these large African cities are growing faster than all other big cities in the world. Among the other top 30 are Mumbai in India, Dhaka in Bangladesh, Sana’a in Yemen, and Hanoi in Vietnam. The 2018 Revision of the World Urbanization Prospects also finds that just three countries—India, China, and Nigeria—together are expected to account for 35 percent of the growth in the world’s urban population between 2018 and 2050. Nigeria alone is projected to add 189 million urban dwellers. Growth in the urban population is driven by a combination of overall population increase and an upward shift in the percentage of people living in urban areas. Together, these factors are projected to add 2.5 billion people to the world’s urban population by 2050 with 90 percent of this growth happening in Asia and Africa. Policymakers from around the world are under pressure to address these immense demographic changes and accompanying urban challenges. Can secondary cities bridge urban and rural economies in Africa?